Do you want to make a difference in a child’s life or in your community? 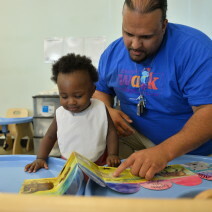 If so, becoming an Early Head Start or Head Start educator in Detroit would be a great career choice for you. Check out the questions and answers below to learn what you need to know to get on the path. What experience and degrees/certifications are needed to get a Head Start job? Where can I get early childhood education training? How do I find a job? What’s the hiring process? Tip: You can download the information on this page here. The required credentials vary by position, and in some cases by agency. Most teaching positions with Head Start and Early Head Start agencies in Detroit require at minimum a Child Development Associate (CDA) certificate, a child care and development associate degree, or a bachelor’s degree in early childhood education. The job announcement is shared. You can find career opportunities in a variety of ways, including on this website, on Head Start agency websites, and online job boards. The new hire completes an agency orientation and receives a training orientation from the education or center manager. Don’t forget to take a look at current posted positions.